The objective of this study was to determine whether MacuView improves the lutein concentration, amount of macular pigment, visual acuity, and contrast sensitivity. The results are obtained from one hundred people with early AMD, in which MacuView was compared with placebo for twelve months. Placebo was an inactive beverage used as a control to determine the effectiveness MacuView. This is common in science to prevent influencing of the outcome results. The human body absorbs lutein from the diet and transports it via the blood to the eyes. In order to determine whether the lutein present in MacuView is good absorbed by the human body, the lutein concentration in the blood was measured. Graph A shows that MacuView significantly improves the lutein concentration in the blood, compared to the placebo. In AMD the amount of macular pigment plays a major role, as it protects the retina and in particular the macula. Therefore, it is important that the macular pigment remains sufficiently available. The amount of macular pigment is determined by measuring Macular Pigment Optical Density (MPOD). Graph B shows that MacuView significantly increases the amount of macular pigment in people with early signs of AMD. Furthermore, the graph shows that when consuming placebo the amount of macular pigment decreases. The visual acuity is measured by means of the famous letter card which is used by an optician or ophthalmologist. The visual acuity is expressed in LogMar units. When the LogMar unit value decreases the visual acuity improves. 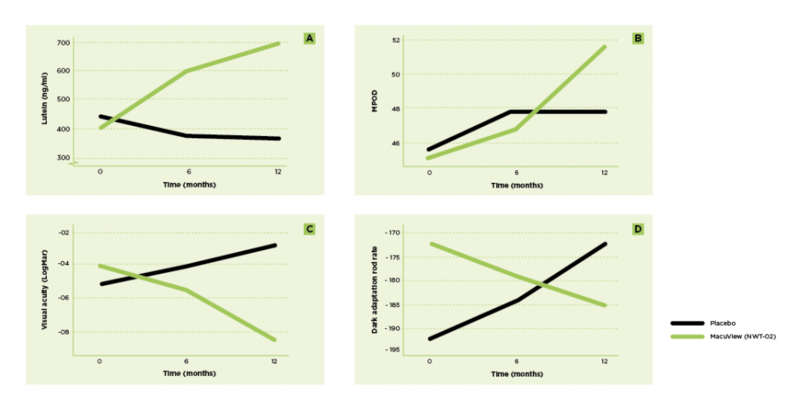 Graph C shows that MacuView significantly improves the visual acuity (reflected by a decrease in LogMar units), compared to the control product. People with AMD often have trouble perceiving difference in contrast, for example, with the observation of different shades of grey. It is also said that the contrast sensitivity is decreased. For the measurement of contrast sensitivity the same is true as for the visual acuity, a declining line means a positive effect. Graph D shows that MacuView improves the contrast sensitivity (reflected by a decrease in Dark Adaptation Rod Rate), compared to the control product. Overall, the results show that MacuView improves the visual function in people with dry Age-related Macular Degeneration and helps prevent AMD. If you have any questions or would like to receive more information, please contact us. Reference: Berendschot, T.T.J.M., Kelly, E.R., van der Made, S.M., Plat, J., & Kijlstra, A. (2013). The effect of lutein-enriched-egg beverage on progression of AMD, a randomized placebo-controlled intervention study. Per 26 oktober 2016 wordt de verkoop van MacuView door Plantina verzorgd.